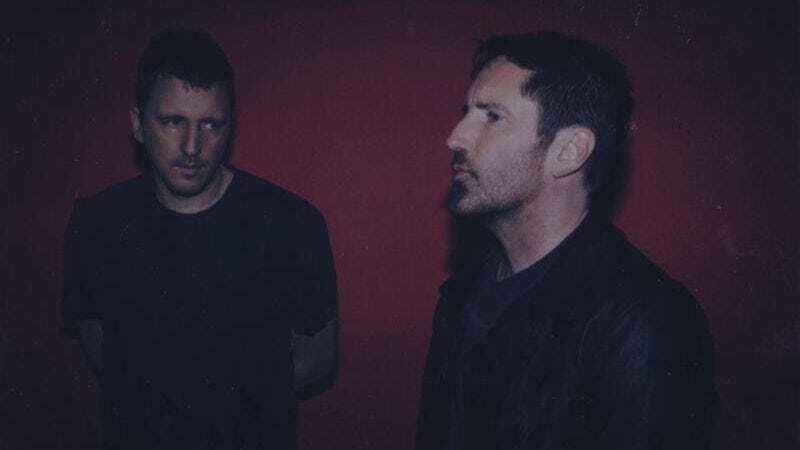 For all of the inscrutable hints about the album’s message—a nod to Year Zero’s multimedia mythology—the songs themselves follow what fans have come to expect from Reznor and Ross, who’s been heavily involved with Nine Inch Nails for a dozen years. Lead single and opening track “Less Than” is the best of the EP’s five songs and compiles numerous NIN sonic signifiers into its pop-ideal 3:30 running time. The spiky synth that opens the song would’ve fit on Pretty Hate Machine or with early ’80s Skinny Puppy, and the huge, polished chorus and expert layering of sonic elements nicely distill what Reznor (and Ross) does so well. They also write good scores, as shown by the Oscar they won for The Social Network and the appropriately chilly score of The Girl With The Dragon Tattoo. Unfortunately, that informs some of Add Violence’s less intriguing moments: “This Isn’t The Place” goes two and a half minutes with only atmospheric synthesizers, light percussion, and some wordless vocalizations from Reznor. EP-closing “The Background World” clocks in at 11:44, but the song shifts at the four-minute mark to follow a musical progression that repeats for eight minutes, slowly growing more distorted as it goes. Before the switch, the song simmers with synth-laden gloom, Reznor painting an apocalyptic picture that offers no hope of something better on the other side: “I know what’s coming / I feel it reaching through / There is no moving past / There is no better place / There is no future point in time / We will not get away.” The drawn-out coda doesn’t add much. Reznor and Ross are master craftsmen of mood and texture, and no one can match Reznor’s skill for translating industrial’s jagged sounds into radio-ready hooks. He has always gone his own way, making for mixed results. Add Violence is a surprising amalgam of what has preceded it in the NIN discography—for better and worse. Listening to Cornelius’ 1997 breakout, Fantasma, which received a deluxe rerelease last year, is like taking a portal back to the late glory days of alt-rock. At the time, music from Beck, The Beastie Boys, Cibo Matto, Björk, Daft Punk, Cornershop, Dimitri From Paris, and so many others promised a post-genre globalist utopia in which exotic sounds freely intermingled. On Fantasma, the camera glides through a retro space station where tropicália sips a martini alongside East Coast boom-bap, with a punk band playing blissed-out indie rock nearby. This was an era when the internet existed but MP3s didn’t, so firsthand music knowledge was finite. A $13.99 shrink-wrapped CD could serve as a portal to another dimension, and Cornelius, following the Shibuya-Kei trend, promised it would be wonderful and retro and cool. In the 20 years since, he’s released a grand total of three records: 2001’s Point, which pulled sounds from the natural world for a more low-key, organic affair; 2006’s spacey jazz explorer Sensuous; and now the brand-new Mellow Waves. Across them, he has charted a path toward ever-more-pleasant vistas, a trend that reaches an almost unctuous apotheosis on Waves opener “If You’re Here,” a song that climaxes with an ASMR shimmer of light guitar-pluck arpeggios that could make you pass out if listened to at a high enough altitude. It sets a fitting tone for an album that melts into the listener’s ears. Older records juxtaposed this headphone friendliness with noisy freak-outs and air-quotes punk tracks, but, a few decades on, Cornelius isn’t out to prove anything anymore. “Dear Future Person” slowly etches out an angelic, aching hook, and “Surfing On Mind Wave Pt 2” explores a purer ambient expression of wistful beauty. If you’re waiting for something to happen, don’t; the back half floats by like a cloud on an overcast day, all acoustic guitars and bedside whispers. Cornelius may not be the second coming of Brian Wilson, as the press proclaimed back on Fantasma’s release, but he’s a sonic curator and composer of rare gifts. Don’t let the lightness of Mellow Waves fool you; its pleasures are substantive and lingering. Purchase Mellow Waves here, which helps support The A.V. Club. It’s an elusive achievement for a musician to create something that carves out a subgenre of its own, making art that doesn’t immediately recall something else or transparently show its influences. It’s even more impressive when that sound makes its way into the pop consciousness without losing its critical credibility. Mark Foster did that with Foster The People’s debut, Torches, and (to a far lesser degree) with its follow-up, Supermodel. Which is why it’s such a head-scratcher that Foster The People’s latest album, Sacred Hearts Club, sounds so much like everyone else. Keeping the superproducers du jour at bay, Foster along with band member Isom Innis take over the bulk of production duties on Sacred Hearts Club. But instead of allowing them to hone their sound, this move has somehow made it derivative. On three of the album’s precursor singles—“Loyal Like Sid & Nancy,” “Pay The Man,” and the infectious if cloying “Doing It For The Money”—Foster even tries his hand at some painful, woefully misguided rapping. Elsewhere, “Static Space Lover” and “Time To Get Closer” tap into the psychedelic sunshine harmonies of The Beach Boys, while “Lotus Eater” is an attempt at ’70s-era CBGB’s punk with a touch of Arctic Monkeys’ lyrical sarcasm. “Sit Next To Me” and the title track are the closest the album comes to Foster The People’s original sound—which, sadly, no longer feels fresh. Overall, Sacred Hearts Club also signals a return to Foster The People’s more electronic origins, but not in the inventive way that was used on Torches. Rather, it comes off as hackneyed copy, full of the predictable EDM/trap beats that every other chart-topper has shoved in somewhere. It’s a deeply disappointing effort that, if there’s any consolation, could be mistaken for just about anyone. Purchase Sacred Hearts Club here, which helps support The A.V. Club. It sounds that way. Intimacy isn’t necessarily a trait one would attach to his previous solo work (or any of his other musical projects, including Avey Tare’s Slasher Flicks), but Eucalyptus was recorded in Portner’s bedroom, and its 15 songs exude an appropriately lo-fi, homespun feel. Swirling around themes of memory and nature, the songs are sloppy and sprawling, with aimless drones and muted strums colliding with found sounds, odd samples, and Portner’s slippery vocals, which morph impressively with the songs themselves. A memorable melody emerges on occasion—“My hope is that it works today,” goes an infectiously optimistic refrain from “Jackson 5,” and the album’s closing track, “When You Left Me,” builds to a crushing, melancholy climax. Too often, however, it feels as if the songs are still finding themselves; in letting them breathe, Portner better achieves the hazy, free-floating vibe for which he’s aiming, but songs like “Coral Lords” and “Sports In July” can feel stuck, as if they’re spinning their wheels until inspiration strikes once again. This improvisatory sense of discovery was likely purposeful, as it complements the album’s themes; the elements of each song emerge as scraps of memory—a sound here, an image there, an offhand phrase—that can never quite coalesce. But while Eucalyptus is undoubtedly intriguing, it’s only occasionally enjoyable as music. Purchase Eucalyptus here, which helps support The A.V. Club. Maybe the British band Childhood sensed a musical dead end after its hazy, tuneful 2014 debut, Lacuna. That record, while pleasant, tended to fade into its own influences—specifically the vaguely psychedelic indie rock coming out of ’90s England. With Universal High, all of the vapor has pretty much disappeared, leaving crystalline pop that feels soulfully ’70s and out of time all at once. That’s not to say it’s timeless, because most of Universal High doesn’t have a ton of personality. It’s got the sound, but only occasionally the soul that it’s going for. Album opener “A.M.D.” at first sounds like it might be a spiritual heir to MGMT, but singer Ben Romans-Hopcraft quickly sheds any notion of weirdness. His falsetto is ingratiating enough when he waxes rhapsodic about “where the high-rise meets the sky,” but it goes down so smooth that it’s tough to remember soon after it’s gone. “Californian Light” adds some lite-funk and a solid hook and tries to go full soul, with stronger results. At points, Universal High finds a hook and rides it somewhere new, but for the most part it’s content to time-travel to safe harbors, layering clean, jazzy guitar over simple grooves or dabbling in yacht rock—hardly a groundbreaking move in 2017. Then again, maybe it’s not trying to be anything more than it is—a gliding, gilded diversion. It does that just fine. Purchase Universal High here, which helps support The A.V. Club.